Aviation Updates Philippines - Leading Philippine carrier Cebu Pacific (PSE: CEB) launched its maiden Manila-Melbourne flight today, August 14, 2018. The only low-cost carrier operating the route, Cebu Pacific, offers thrice weekly services using its Airbus A330 aircraft fleet. SECOND AUSTRALIAN ROUTE. Melbourne is Cebu Pacific's second Australian destination after Sydney. Photo by Cebu Pacific Air. CEB launches the new route with a Tuesday, Thursday and Saturday frequency, and an all-in seat sale fare of PHP3,999 per way until August 20, 2018, or until seats last. Travel period is from October 01, 2018 to March 30, 2019. After this seat sale, lowest year-round fares are 60% lower than other airlines'. Candice Iyog, Cebu Pacific vice president for marketing and distribution said during the inaugural event, "This new route will enable more Australian travelers—from adventure-seekers to leisure tourists to families on holiday—to discover the paradise that is the Philippines." "This will enable more Filipino immigrants, or Australians of Filipino descent, to discover their roots or visit family and friends more often," added Iyog. Australia is also home to a considerable overseas Filipino community. More than 300,000 Australian residents are with Filipino descent, with more than 68,000 based in the Melbourne area. 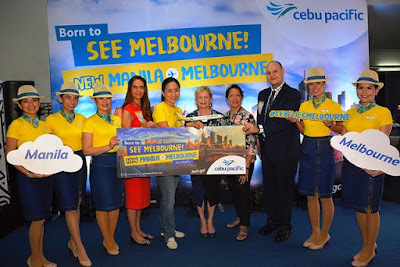 Melbourne is Cebu Pacific's second destination in Australia, since it entered the Australian market in 2014 with the launch of its Manila-Sydney flights. The airline has helped spur travel and commerce between the two destinations; and has since led the route in terms of passengers and cargo carried.